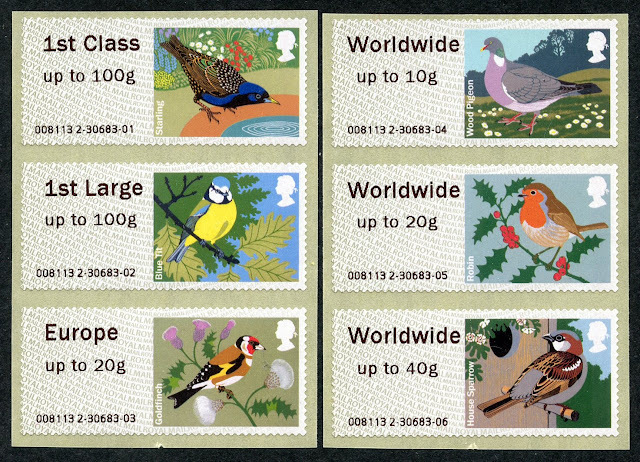 The Cambridge Birds 1 version 2 Faststamps mentioned here, have sold for what is believed to be a record price on eBay. This modest-looking set of 6 x 40g Worldwide, which cost £9.90 last month, sold for £361.50 on eBay this week-end. Thirteen bidders chased it up but the winning bid was sniped 2 seconds before the close. The first under-bidder had made a few bids and probably thought that bidding 10 seconds away would win it, but he was beaten by £10. A set of these sold at the same time on eBay for £78.54. 7 bidders fought for this one. The high price for the Worldwide 40g set comes about because when this particular set was issued the machines only dispensed 5 values: many collectors obtained the set of 30. Stanley Gibbons' catalogue assigned a number to each possible value (rather than each design). Now that the machines have been upgraded to provide the additional value 'Worldwide 40g' a new catalogue number must be assigned, and collectors will want this. Nobody knows how many of either set were produced but some will have been bought by collectors in small numbers, and others will have bought multiples for sale. But there will be very few. Allegedly only a part roll of these were used not a full one in Cambridge. Information suggests 4 collectors strips and 64 6x40g were obtained from this part roll. Reliable information can ACCOUNT for those, but we don't know how many were bought by ordinary members of the public or maybe as single sets by other collectors between their first discovery on (I think) Tuesday, and the roll being run to exhaustion on Wednesday by the person who bought the majority of those 40g strips. The seller of these was told by the PO employee that the roll was loaded without them being aware that they were different to the Birds most previously used. The implication/understanding was that it was a whole roll, but it may have been the remains of a roll that was discovered. As also reported, the Cambridge office and these machines changed location from when the Birds 1 were originally issued.